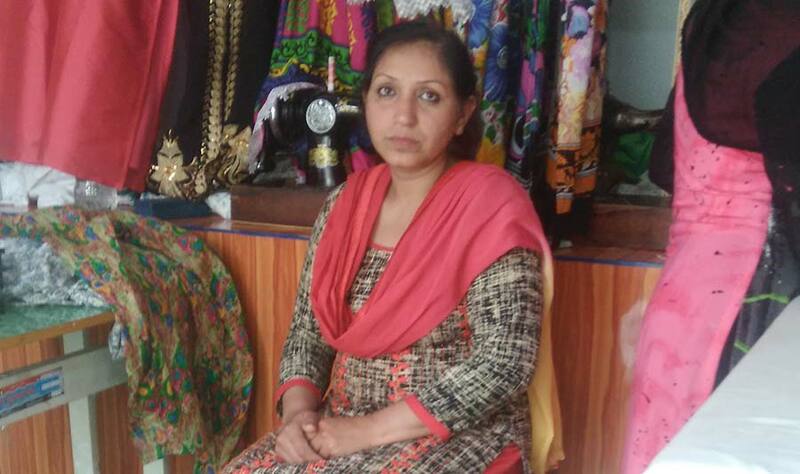 She named her boutique Tailor Bird, and it operates successfully in Rawathpora, that falls in Baramulla’s Delina belt. The woman behind this initiative is 33-year old Imrana Meher. Her story is more interesting than the initiative she works for now. Imrana was brought up in middle-class family of Samanabad, in a Lahore neighbourhood. She gave up her studies after completing her twelfth standard and the reason was her keenness to help her brother who was a small level “fashion designer”. It was during those years of “help” that she learned the art of sewing women clothes. In 2004, the family got a proposal for her marriage. It was Sonaullah Dar, a resident of Delina. Dar had crossed over to become a militant. Instead of becoming a militant, he decided to settle. The Lahore family agreed to the marriage proposal that had come through a mutual. The marriage took place and they started living at Imrana’s home. He became the member of their family. “Dar Sahib was asked by my family to look after their business of stationary,” says Imrana. A few years later, the couple moved to Muzzafarabad, the capital of Pakistan administered Kashmir, and lived there till 2014. That year they shifted to this side of Kashmir under a rehabilitation scheme for the militants who wanted to return home and renounce violence. The scheme was operational during Omar Abdullah’s government. The couple returned home via Nepal. Their first year was consumed in settling down in Sonaullah’s native home. They were entangled in the family feud to regain the share from their ancestral property that Dar’s brother had “occupied.” Their claim to their inheritance impacted her husband’s relationship with his brothers. Imarana says it was a serious hurdle. Once the tensions eased at home front, Imrana in 2015 decided to use her skill to make a living. She initially started sewing clothes from her home. She said she bought a sewing machine by selling her jewelry and her friends in the neighbourhood were her first customers. Now in the span of six months her popularity grew and she started getting orders across Baramulla, because of her unique stitching style. As customers swelled, her room fell short. “There was a sudden increase in customers and it was hard to manage the rush of customers in a small room, where my family resides,” Imrana said. “I decided to take a shop on rent and shifted my boutique.” The experience has been challenging but satisfying. The extended family was initially reluctant but it did not matter eventually. She had to borrow money from her neighbours to start her boutique. Imrana has two daughters, of 8 and 12 years of age. Her husband has not been able to find a job, so far. He does labour work now. This situation made her the main earning person for her family. Imran is satisfied and happy. She enrolled her daughters in private school and wants them to study. “I am not highly qualified but I always wished my daughters go for higher education,” she says.